This set of 8 WIP removable markers has 4mm multi-colored multi-faceted beads attached to silver plated leverback clasps. These removable markers can easily be placed anywhere on your knitting or crochet and can also be used directly on your knitting needles (fit up to a size US 11). The markers are fitted with 6mm white resin beads with black numbers. 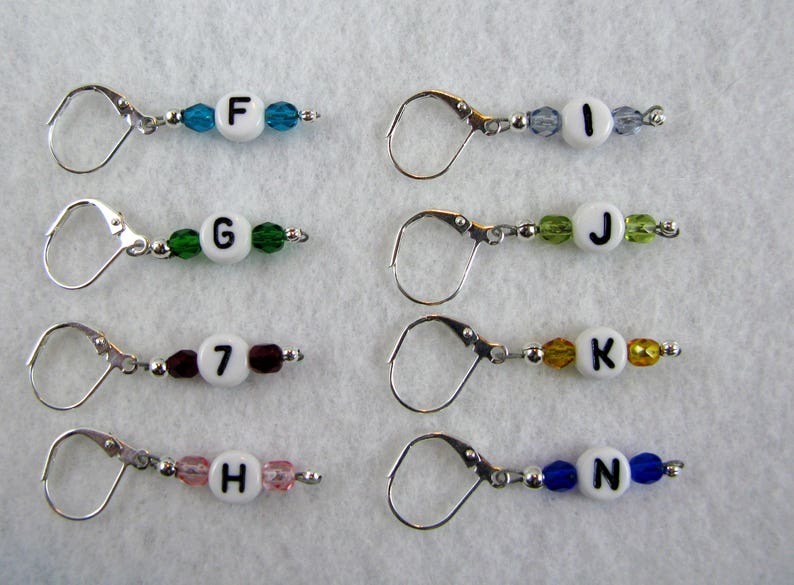 This set of 8 includes: F, G, 7, H, I, J, K, and N.
You may request any 8 hook letters and we also can use lobster claws instead of leverbacks. Just put your request in the comments section. Just what I needed to help straighten-out my knitting project. They're perfect and well-made. Highly recommend vendor.